 Any floor at habitable height beyond 9M and not exceeding 28M above ground level.  One basement exceeding 500 square meters in gross floor area. 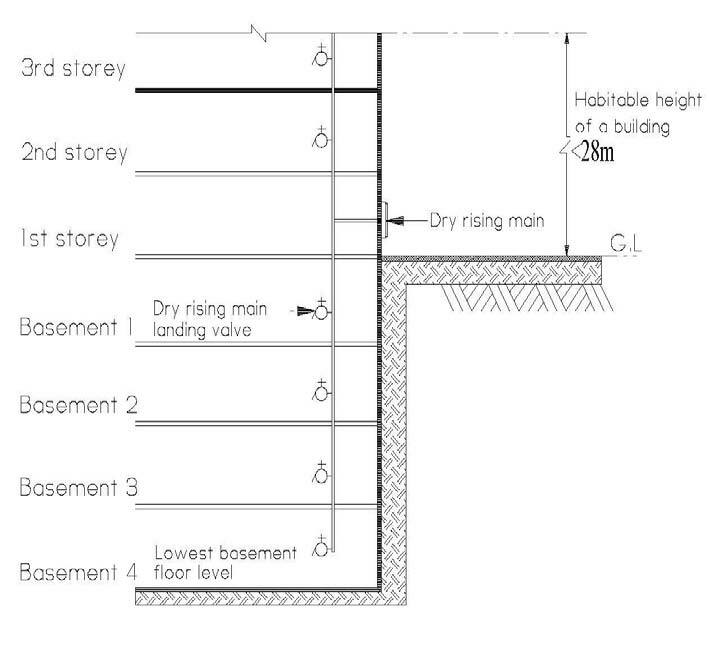 2.1 All parts of any floor not more than 28M above the ground level is within 38M from a landing valve, the distance to be measured along a route suitable for hose lines, including any distance up or down a stairway. 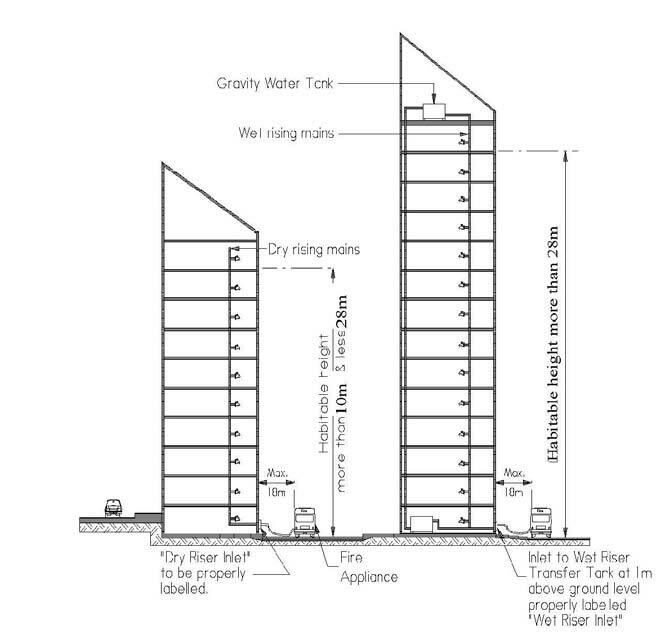 2.2 One rising main is provided for one or a series of floors higher than 28M above ground, with each rising main serving not more than 930 square meters of any floor and subject to all parts of the floor to be within 38M from a landing valve. 3.2 In a smoke-stop lobby or common lobby in close proximity to the exit staircase. 3.3 Where firefighting lobby, smoke-stop lobby are not provided, each required exit stairway with landing valve. 3.4 Landing valve of the rising main shall be installed between 1M and 1.4M relative to the finish floor level. 4.1 100mm diameter where the rising main does not exceed 28M in habitable height and serving only one landing valve per floor. 4.2 150mm diameter or higher where the rising main is in combination with the fire sprinkler system serving two or more landing valve per floor. 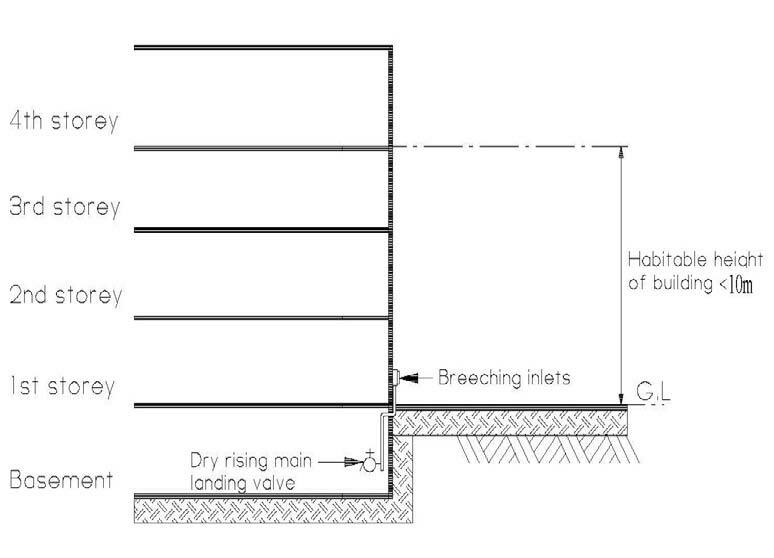 5.1 On an external wall or a boundary of a building and to be within 18M of the adjacent fire appliance access road. 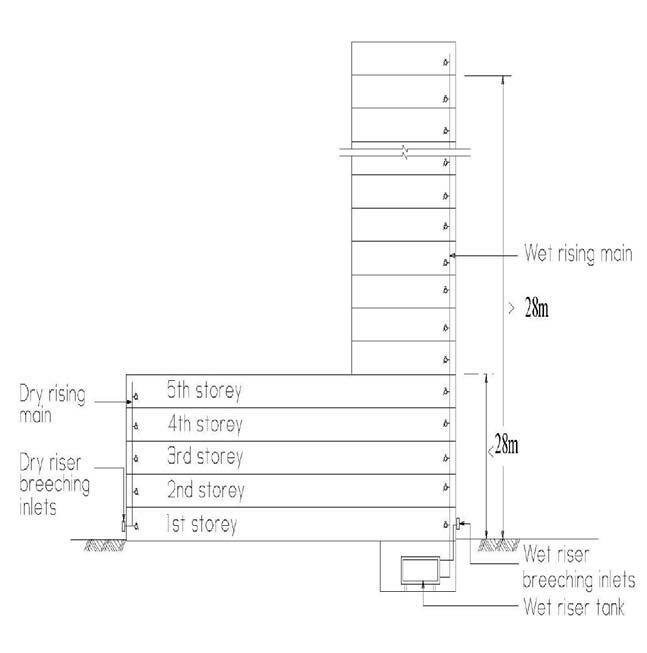 Each rising main shall be fitted within a breaching inlet with non-return valve directly at the foot of the same riser stack. 5.3 In a conspicuous position readily visible and accessible to the firefighters.